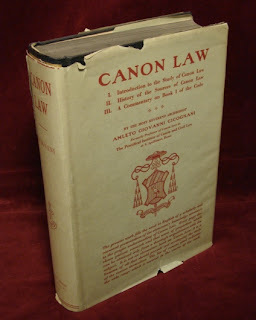 This weekend in my spare time I was browsing through an old commentary on the 1917 Code of Canon Law by an Archbishop Giovanni Cicognani, Professor of Canon Law in the Pontifical Institute of Canon and Civil Law at St. Apollinare's in Rome, published 1935. By the way, in case you entertained any uncertainty as to how much of a dork I really am, knowing that I read commentaries on Canon Law during the weekend should take the last bit of doubt away. This is a truly massive tome, at least 800 pages. It was formerly used as a first year textbook for those beginning their seminary education and was the required reading for a class called "Introductions," which was a one semester course that attempted to cram the concepts of Canon Law, the history of the sources of Canon Law, a commentary on the 1917 Code and some supplementary info on natural, eternal and positive law into a single class. The stamp in this book says it was from Duns Scotus College in Detroit (opened 1930, closed in 1979). By the way, that is the actual book in the picture to the left. I know they still offer Canon Law classes today in seminary, but I doubt they are as thorough as what is covered in this one introductory book for beginners. It is amazing the amount of scholarship and erudition we have lost; it reminds me of Aquinas' comment that the Summa is meant to be "instruction for beginners." There are so many great points in the one chapter that I read that it would be burdensome to enumerate even half of them; but I can say that if our priests and bishops had the type of formation in Law (of all types) that the author of this work seems to attempt to inculcate in his students, many subsequent problems regarding obedience and proper interpretation of documents would have become moot. Let me give you two examples. Interesting to me from a Traditionalist standpoint was the section on custom. Cicognani starts with the premise that established custom is in fact a form of law and gives it the name Consuedtudinary Law (from the Latin word consuetudinarium, which is best interpreted as "customary). He does not just state that it is a supplement to written law (positive law), but says that it has the force of law itself. In other words, it is equal with positive law, but just of another type. But he goes further and states that the origin of all positive law is originally from custom; positive laws are simply customs written down and legistlated upon. "There were no human laws in the beginning of human life, for mankind was ruled by manners and customs" (p. 639). Based on this reality, he says that it is false to take the positon that customs/traditions are merely supplementary to written laws. On the contrary, it is written laws which appear as supplements to custom. Written laws are handmaids to custom, constructed and called upon only when custom is ambiguous or ill-fitted for a certain question at hand. But through most of human civilization, customary law has been the norm and crux of all legal systems. Now, Catholic Canon Law is an outgrowth of Roman customary law. 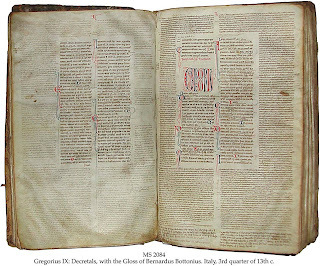 Speaking now of ecclesiastical Canon Law (in the context of custom), the great canonist Gratian (c. 1150) says in the Decretals, "Custom is that certain law established by usages in observance for a long time, which is accepted as law where there is no law" (c. 5, D. I). This later became part of the 1917 Code in Canon 29, "Custom is the best interpreter of the law" (consuetudo est optima legum interpres) and was retained in Canon 27 of the 1983 Code. This reality is what Traditionalists have tried to get through to conservatives for a long time regarding such issues that were mandated by the 1917 Code but not mentioned in the 83' one (e.g., the law commanding women to wear veils in Church, mandated in canon 1262.2 of the 1917 Code but not mentioned in the 83 Code). When no law is in place, as Gratian says, "where there is no law," then custom is to be looked to. But in what capacity is it to be looked to? As guidance? As a suggestion? No; as Gratian says, it is to be "accepeted as law where there is no law." This is even taught in the 1983 Code of Canon Law in Canon 21: "In a case of doubt, the revocation of a pre-existing law is not presumed, but later laws must be related to the earlier ones and, insofar as possible, must be harmonized with them." Custom has the force of law. A human lawgiver is never able to foresee all the individual cases to which law will be applied. Consequently, a law, though just in general, may, taken literally, lead in some unforseen cases to results which agree neither with the intent or the lawgiver nor with natrual justice, but rather contravene them. In such cases the law must be expounded not according to its wording but according to the intent of the lawgiver and the general principles of natural justice. Law in the strict sense is, therefore, positive law in its literal interpretation; equity, on the contrary, consists of the principles of natural justice so far as they are used to explain or correct a positive human law if this is not in harmony with the former. Epiky is therefore defined: The benign application of the law according to what is good and equitable, which decides that the lawgiver does not intend that, because of exceptional circumstances, some particular case be included under his general law (p. 15). I know that is a lot to swallow, but essentially he is saying this: it is possible to misapply or misinterpret human laws and decrees for a variety of reasons; or, we can discover that what seemed like a good idea in general turns out to be unworkable when the law is applied to the nitty-gritty scenarios of everyday life. In such situations where the outcome of enforcing the law actually runs counter to natural justice, we are to interpret and enforce the law in keeping with the intent of the lawgiver, even if this means neglecting or contravening the actual wording of the law. As St. Thomas says of such cases, "In such cases judgment should be delivered not according to the letter of the law, but according to the equity which the lawgiver has in view" (STh, II-II, q. LX, 5). Let's apply this to the current situation in the Church. We have a bunch of documents and decrees from the Conciliar and post-Conciliar period that, in the least, suffer from a degree of ambiguity both in their original promulgation and in their subsequent implementation. Such ambiguity ("timebombs" as Davies calls them) have led to interpretations and implementations of the law that are not only not as good as they could be but are actually destructive to faith, morality and justice. Now, what are we to do? Let's apply the two principles we have enumerated regarding epiky and customary law. Knowing that positive law is a supplement to custom, we ought to first look to the custom of the Church. An example is Pope Leo XIII's using of custom and precedent to render his judgment on Anglican orders in 1896. Custom, found in all of the words of the popes, councils, fathers and saints, but more importantly in their actions and judgments, tells us how the Church has always acted in such cases and thus gives us an intepretive principle for how she ought to act now. But what if the customary solution runs contrary to the law now in force? Well, if the inplementation of such a law is unjust or leading to the destruction of faith, then the principle of epiky comes in to play. Even if we must ignore the letter of the law, we interpret the law in the spirit of the lawgiver. Here you probably cringe when I say to intepret something in the "spirit" of a lawgiver. But, I did not say in the spirit of a majority consensus of liberal periti; no, I said the spirit (i.e., intent) of the lawgiver. The lawgiver is the Church, promulgating law as a juridical person. So, when we apply epiky, we temper the letter of the law with the intent of the Church, whose universal mission is to save souls. This mission of the Church is referred to in Cicognani's books as the Supreme Law. In brief, if some law is prohibiting the Church from fully exercising her mission to proclaim the truth and save souls (e.g., a prohibition against kneeling in a certain diocese), then to hell with the letter of the law. Even though the law may say one thing, those who act more in accord with justice are actually the ones keeping the higher law, while those insisting on an unhealthy application of the law are guilty of contravening the higher law. Now, this is a very coarse paraphrasing of Cicognani's statements, and I certainly do not mean them to be taken in the sense that we can simply be disobedient if we don't like the rules in place. It has nothing to do with liking or disliking, but rather of justice. As the author points out, there are times when laws are found to be harmful when applied. Abraham Lincoln had a famous quote that said "The best way to get an unjust law overturned is to enforce it strictly." Epiky tells us how we are to react to such a law; custom what to do in the case when there is no law. This is a wonderfully interesting subject and very pertinent to today's Church. If the princes of our Church were thoroughly grounded in these concepts, I don't think they could have so easily chucked out our long and venerable traditions in favor of the illusive phantom-utopia church envisioned by the liberal prophets of the 1960's. It was kind of difficult, but I found a copy of Archbishop Cicognani's book for sale for $12.00 on Biblio. It is a great find and I heartily recommend it. Click here for it. By the way, in case you entertained any uncertainty as to how much of a dork I really am, knowing that I read commentaries on Canon Law during the weekend should take the last bit of doubt away. Bravo. You have "hit the nail on the head." Maybe the "princes" of the church should all receive a copy of this. I'm sure Pope Benedict would be in favor of that, as well. Warm greetings in the True Christmas Spirit! I hope all is well, you seem very knowledgeable. I read through your blog/web site--very sharp indeed! Do you have a Doctorate in Divinity or Philosophy? Anyhow, I was wondering if you could give some priceless advice. I am thinking of buying a some good old Catholic theology books for some family members and loved ones, and well, I recently received an advertisement for this very interesting book called "Communicatio in Sacris: The Roman Catholic Church against Intercommunion of non-Catholics" by Mr. William J. DeTucci. I was wondering if you have seen any book review on this book? I could not find anything on the author. It seems the book talks about the Role of Vatican II in the Modern World and how some Traditionalists have resisted many of the Modernistic teachings of Ecumenism, Religious Liberty, and the New Mass, as opposed to the old Latin Tridentine Mass. However, I also recently read Benedict XVI's Motu Proprio ( www.vatican.va), which seems to be give the Liberty of "Open Communion" to so-called Traditional Catholic Groups who dissent from Vatican II, i.e. Marcel Lefebvre's SSPX, Mark Pivarunas' CMRI, Clarence Kelly's SSPV, Br. Michael Dimond's Most Holy Family Monastery, the various Saint Benedict Centers, Jason Spadafore's Raphael Society, Patrick Taylor's Society of the Virgin Mary, and so many other Independent Bishops at Large)--all who promote Intercommunion Latin Mass Ritual, of course! I think the Spirit of Vatican II is really being recognized now by many of the Traditionalists who once followed Bishop Lefebvre in resisting Vatican II Conciliar Reforms, but since the Motu Proprio Latin Mass Ecumenism has been widely promoted and it has been "well received" by many of these same various Traditionalists Sects and also by many Liberal Bi-Ritual Bishops who offer both the Latin Mass and Ecumenical Modern Liturgies. I would most greatly appreciate any book review that you or a theologian has done. This book seems to have positive merit in as much it claims to be "a Compendium of Roman Catholic Doctrine on the subject of Intercommunion with non-Catholics. This book produces the overwhelming theological consensus for the Dogmatic Teaching condemning Intercommunion with non-Catholics, putting together a treasury of Sacred Scriptures, Church Fathers, Doctors, Saints, Theologians, and Popes who have written on the matter." However, I just wanted to verify that before I make my last minute shopping for this Christmas & New Year Season. I believe I have heard of this book, but I cannot be certain. I think it is okay; usually compendiums are good sources of Catholic teaching, and I recall reading a review of a book on Catholic teaching on Ecumenism recently, but I simply can't be sure. Ott's Fundamentals of Catholic Dogma is more solid, but it is not just about ecumenism. As for me, I have no doctorate, just a crappy BA in History from unaccredited (and now defunct) Ave Maria College(though I'm doing post-graduate work right now). After, recently getting it Mr. DeTucci, this new scholar, has really worked up a Masterpiece of Sources, like Doctor Denzinger did over 100 years ago, but focused on this Controversial Matter of the Sacred and the Profane, namely: Whether it is objectively a mortal sin to confect and receive sacraments outside the Catholic Church, the true church of Christ? Mr. DeTucci holds nothing back! I love that! I guess he is not a Professor of Theology, as yet, but he seems to have some credentials, as does the Contributor Editing Mr. Pollock has. I read their bios which are provided in the book. So, this book I highly recommend. Patty and Boniface, you really should hear me out, because I have a lot of experience in Catholic Apologetics and Catechesis, and this book is something that answers questions burning inside many of use Apologists as far what is the true meaning of No Remission of Sins Outside the Church, which the Glorious Popes Boniface VIII and Leo X (at the Lateran Ecumenical Council) both declared in the Papal Bull Unam Sanctam respectively. Mr. DeTucci shows the complete continuity of this dogma with reference to the Sacramental grace outside the Church. Very well put together, Positive, Dogmatic, and Moral Theology all glued together. I must say Nihil obstat for this book, because it is all good Catholic Dogma. Hi its me again a late comer to this one as well...real late. Great article btw on this book on Canon Law! Its no longer available but if you come across it somewhere for that kind of price please let me know & I'll grab it up in less then a heart beat. I noticed in the comment thread that in response to Patty who mentioned the book by DeTucci, Communicatio in Sacris, someone identifying themselves as Jim Akins responded back giving his approval to this book. My problem is several fold. First, and I could be wrong, but I seriously wonder if this is the Jimmy Akin who is the well know apologist for Catholic Answers and who has his own blog. He says that Patty should listen to him because "I have a lot of experience in Catholic Apologetics and Catechesis". This would tell me that he is identifying himself with that Akin. Like I said I could be wrong but that is the impression we are left. However that apologist spells his name Akin not Akins. Secondly, I find it hard to believe that a non traditionalist apologist like Akin would recommend DeTucci's book at all. Boniface, I dont know if you have since this time looked up DeTucci but William DeTucci is a well known sedevacantist. In this book he refers to Popes from Paul VI to Benedict XVI as "anti popes" and "heresiarchs". If Akin has criticized the SSPX and the SSPX is inside the Church and are non sedevacantists why would he endorse someone who is a sedevacantist? Im sure the book is a good compendium of Catholic sources but that can be put together conceivably by any scholar Catholic or even secular. I agree with you that Patty should stick to Ott. Or if she does read DeTucci's book she should read just the source material and ignore his ignorant rant about the SSPX. Even if one is not a supporter of the SSPX it goes outside the realm serious criticism.